Modders are creating Vice City in GTA 5, because that is what modders do. The above trailer takes you on a tour through the work-in-progress city. It took me a while to realise what it was that bothered me about the video. It's not Vice City's flat textures, and the way they feel strange under GTA 5's more realistic lighting. 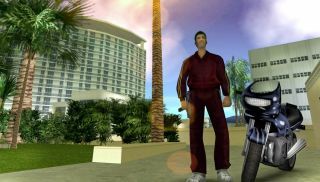 It's that Wave 103 isn't playing in the background, as it always is whenever I'm in Vice City. Not perfect, sure, but it works better than the attempt to mod GTA: London into GTA 5. The map isn't finished yet, and, as such, the mod hasn't been released. While we wait, take a look through our recommended GTA 5 mods.